Charles Withington is a Darling-based negociant who releases wines under his family name, the latest being Nguni Malbec 2015, the grapes from respected grower André Kirsten of Oranjefontein farm and only lightly oaked – matured for six months in old barrels. 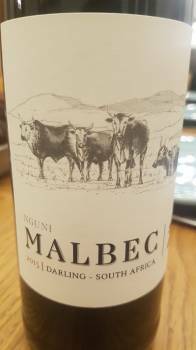 Single-variety Malbec can be quite hard work but this is charming with a very attractive nose of red and black fruit, flowers and fynbos while the palate is medium bodied with pure fruit, fresh acidity and fine tannins. A bargain at R90 a bottle. Previous articleMarthélize Tredoux: Can SA wine’s image be fixed?